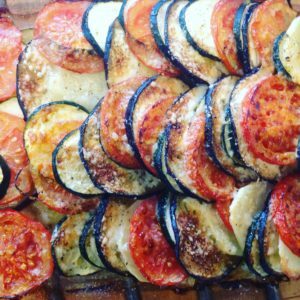 A fabulous accompaniment for grilled fish, chicken, lamb, beef or simply on its own, this vegetable tian is tasty, easy and I promise they’ll be coming back for more. Preheat the oven to 180 degrees C/ 375 degrees F.
In a medium saute pan, heat 2 tablespoons of olive oil and cook the onions over medium-low heat for 8 to 10 minutes, until translucent. Add the garlic and cook for another minute. Spread the onion mixture on the bottom of the baking dish. Add more oil and fry the aubergine slices until soft. Layer the vegetables alternately in the dish on top of the onions, fitting them tightly, making only 1 layer. Sprinkle with salt, pepper and drizzle with 1 more tablespoon of olive oil. Cover the dish with aluminum foil and bake for 35 to 40 minutes, until the vegetables are tender. Uncover the dish, remove the thyme sprigs, sprinkle the cheese on top, and bake for another 30 minutes until browned.